The fastest internet can be found in small, rich nations such as Iceland and Norway. The internet is getting faster. Ookla, an internet analytics company, recently released its state of the internet report, showing mobile and broadband internet are accelerating around the world, although not every country is keeping pace. 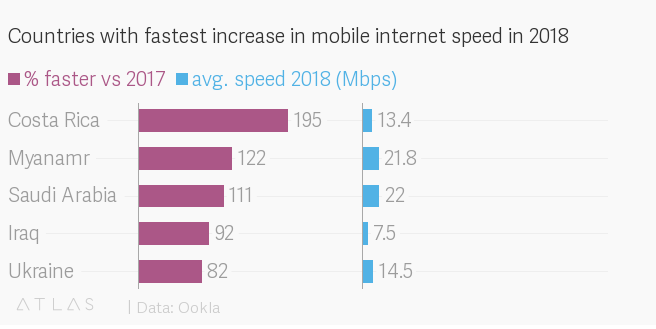 In 2018, mobile internet speeds rose 15% on average to 23 megabits per second (Mbps) down (15.2%), while upload speeds rose 9 Mbps (11.2%). Broadband internet (over fiber optic or metal) surged 26% to 46 Mbps down, and 22 Mbps up. That’s a slightly slower rate of increase than 2017, but telecoms are steadily building out new infrastructure, especially fixed Gigabit connections (many cities got the high-speed service for the first time in 2018) and 4G (with “5G” on the way). Where can you go for the fastest internet? Small, rich nations are your best bet. Norway and Iceland top the list. Their blazing fast mobile internet speeds are roughly twice as fast as their fastest big-nation counterparts, China and US (31 Mbps and 29 Mbps, respectively). Fixed internet speeds show a similar pattern. US internet service providers are steadily catching up. This year, the US saw a 36% increase in mean download speed, ranking it 7th in the world between Hungary and Switzerland. As for the slowest countries among the 124 ranked, Tajikistan, Afghanistan, Iraq, Algeria, and Venezuela finished at the bottom with recorded speeds of 7.5 Mbps or slower. But those near the bottom have made progress. Among the most-improved countries, Iraq made the cut, according to Ookla.